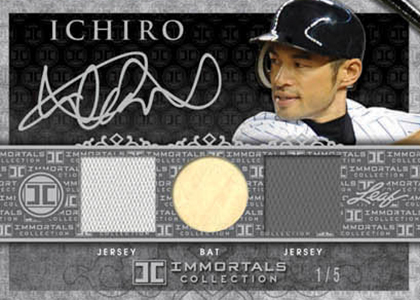 Ichiro Suzuki is something of an enigma in the hobby in 2013. 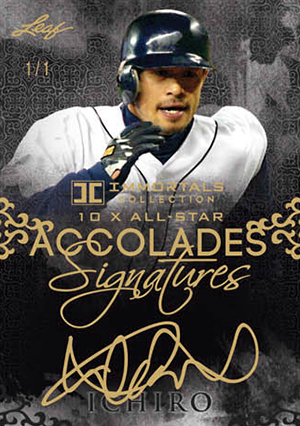 Having not renewed a deal with Topps, the Japanese superstar has only appeared in a couple of products. 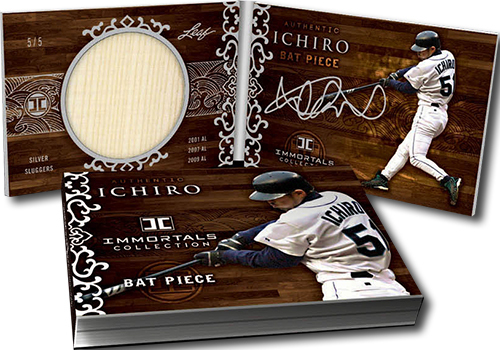 Ichiro's profile is about to change in a big way, particularly with high-end collectors, with 2013 Leaf Ichiro Immortals Collection Baseball. 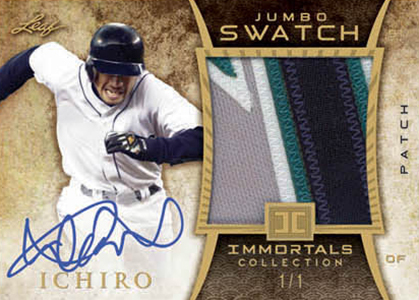 The pricey release is dedicated to the future Hall of Famer and promises an Ichiro autograph in every box. 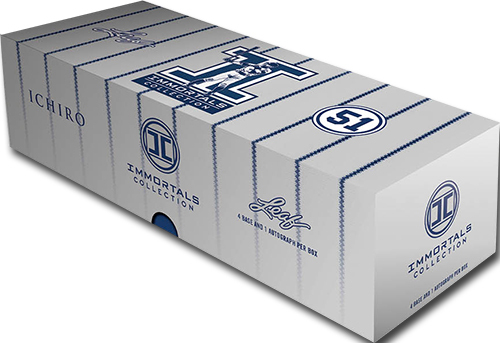 2013 Leaf Ichiro Immortals Collection Baseball has a very limited print run of 300 boxes. Each comes hand-numbered. Inside are four base cards and one autograph. Base cards are numbered to 51 copies each. Chronicling the outfielder's career, they also come with parallels numbered to 20, 5 and 1 as well as one-of-one Printing Plates. 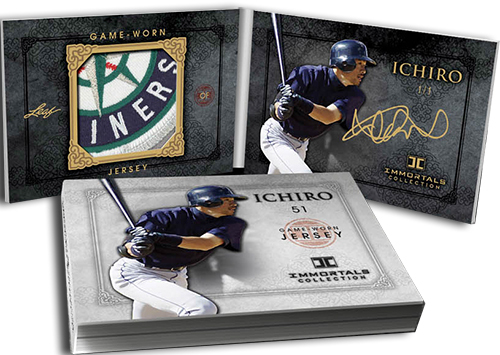 While those are nice, the big draw of the product is the guarantee of an Ichiro Suzuki autograph, all of which are numbered to 5 or less. 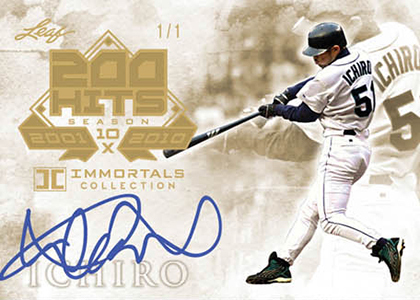 Despite tremendous demand, Ichiro is a notoriously tough signature in the hobby. It has been alleviated somewhat recently thanks to an exclusive deal with Leaf. 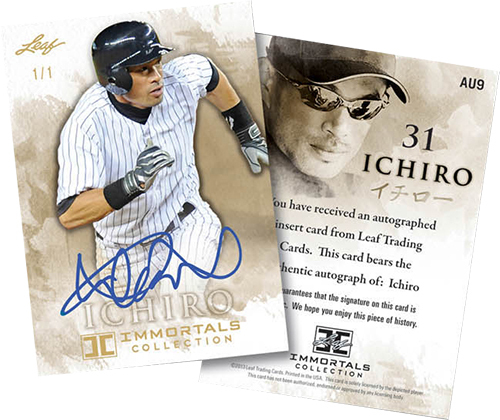 Ichiro Immortal Autographs are signed versions of the base cards and are numbered to 5 or 1. 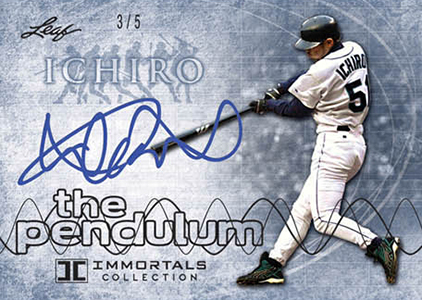 The Pendulum Autographs pay tribute to Ichiro's bat and his tremendous swing. 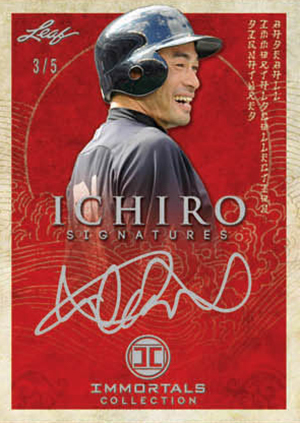 Other basic signature cards include 200 Hit Autographs, Accolades Autographs and Ichiro Signatures, which features a bold design. 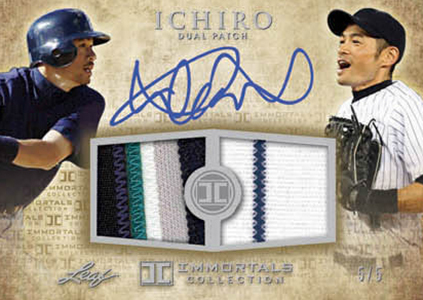 2013 Leaf Ichiro Immortals Collection also has a handful of cards that combine autographs and game-used Ichiro gear. Dual Jersey Autographs have swatches from both Mariners and Yankees jerseys. Triple Memorabilia Autographs add a piece of a game-used bat to the mix. There are also Jumbo Jersey Autographs and Jumbo Patch Autographs. 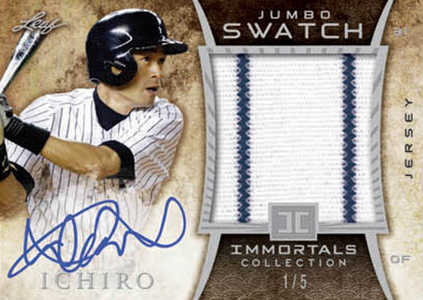 Lettermen Autographs are the first of their kind for Ichiro. 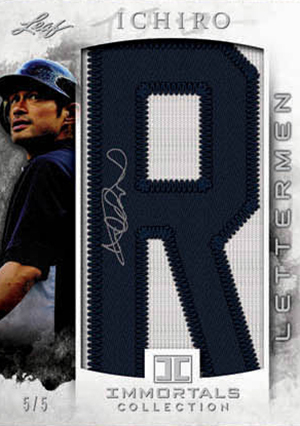 Leaf has also produced a set of Kanji Lettermen Autographs that spell out Ichiro's name in Kanji. 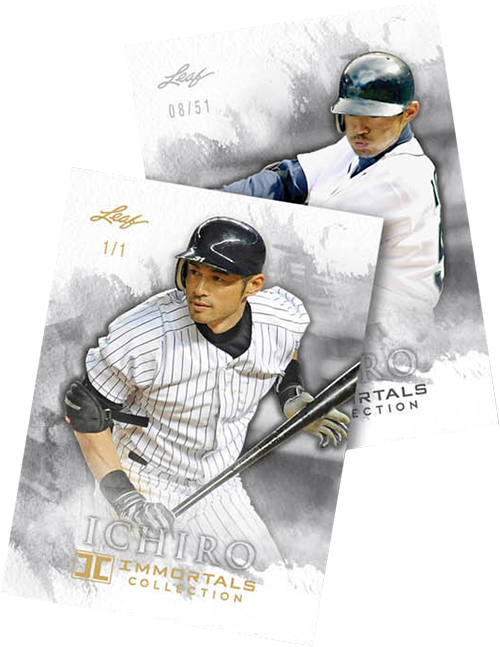 Although everything in 2013 Leaf Ichiro Immortals Collection Baseball is high-end, there are some cards that take it to another level. Patch Booklet and Bat Booklet Autographs have huge pieces of memorabilia. A Bat Knob Autograph has both the end of his bat and a signature. 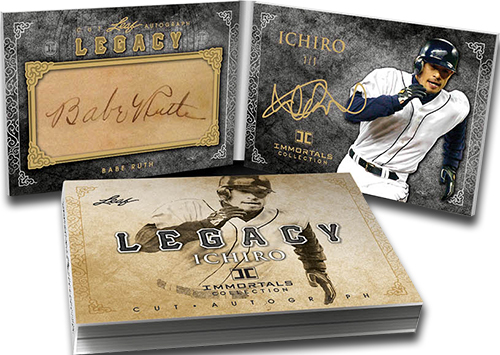 Finally, there are Legacy Booklet Autograph Cut Cards. One side has the Ichiro autograph. It's paired on the other side with a cut signature from an all-time great. Players include Babe Ruth, Honus Wagner, Lou Gehrig, Mel Ott and Pete Rose.